Well there it was done, and at last a period of relaxation “sans stress” is on the cards. As promised, no more writing as I can’t tell you how the event went, all I can say is that I, personally, had a brilliant day with some the best folk in the world. Thanks again to everyone who made the effort to be there and share the fun, but most of all to my friends at The Treacle Tap and Great North Pie Co, The Macc and The Wharf, you guys rock! I hope that at least some of you Twissupers will return to these cracking venues to drink great beer again. Plus of course everyone at RedWillow, who I know worked like dogs to get the brewery in the condition it was for our enjoyment, you deserve every success that you are getting and more. Gregg impersonating Tommy Cooper “muss-like-that’.. The RedWillow chaps pulling their pork! I really have no idea, Funky Chicken? Yes, I’m still alive and kicking and (I hope) everything is on schedule still for the Macclesfield #Twissup on Sat 29th June. A few weekends ago I went to spend the day with Mr Jay Kraus at Quantum Brewing to brew the previously announced Blood Orange Pale Ale that was to go with the breakfast pies at our first stop. I had an absolutely great day including a post brew visit to Stockport beer festival, and helping to stave off a less than stealthy invasion of Scotland’s most famous bowler-hatted beer guzzler. This left us in the unfortunate position of being too late to brew again or source something unique as we’d hoped especially with the breakfast connection we were hoping for. So, after much ado, we sadly had to accept defeat on the new beer for the Treacle Tap. More bad news I’m afraid, (but trust me, again it gets better) the triple Mckenzie/Kraus/Stronge collaboration brew failed to materialise. Not through want of trying, purely the logistics of diaries. I’m led to believe this was just for starters… More news to come on that front in the next few days.. Despite Toby’s ever so subtle twitter clues, not many folks picked up on the fact that this was something very special indeed. This is massive well deserved news for Red Willow and hats off to Virgin Trains too for using locally sourced suppliers to service their onboard stores, of course it has obvious benefits to the beer loving rail traveller too as you will as of this coming Saturday be able to sup Red Willow Tilting Ale as you go, proper “train beer”. Launching at Treacle Tap on Friday 21st June it will be on trains the day after. But there’s more.. Once Virgin learned of Red Willow and Treacle Taps involvement in the Twissup event, they contacted me to offer sponsorship (which sent me into fits of mild panic, “it’s turning into a monster” I thought). I needn’t of worried though as they have been brilliant, offering support to compliment rather than a marketeers takeover. 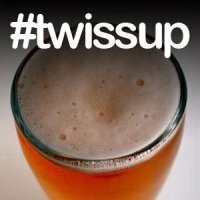 There are a few things in the pipeline but I have managed to secure twissup attendees with a bottle of Tilting Ale for your journey home (train beer). Stay tuned for details on how to get one..
As previously reported Nelson Saison is due in town at The Macc for #isosceles, then it nearly wasn’t after a change of management at the venue. Thankfully, after more than a few tense days we are sorted and the beer is winging it’s way north. What absolutely cracking timing for the twissup, a fine choice by CAMRA and top news for The Wharf, our last but by no means least stop of the #Twissup. I shall now stop wittering and go to pour myself a nice cold one, having unburdened my befuddled brain of #Isosceles info, keep your peepers peeled though as there are lots more updates to come, including maps and a sort of itinerary..